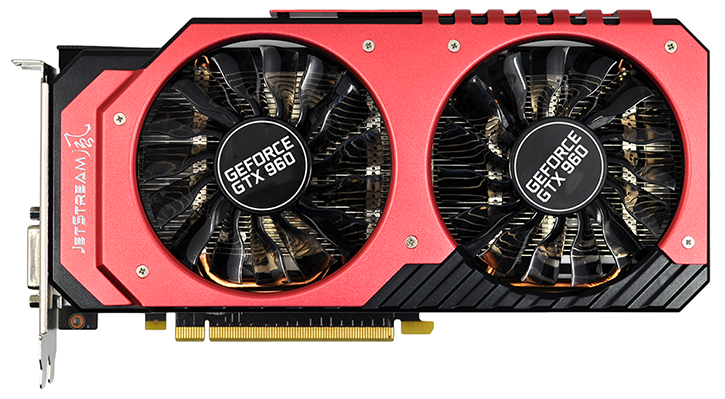 The GeForce GTX 960 is official and that means partner cards are arriving thick and fast here at HEXUS HQ. Nvidia's hard launch has resulted in good stock availability at a number of retailers, and with no reference design as such, there's a smorgasbord of overclocked cards to choose from, with prices ranging from £160 to £195. We've already examined Asus's Direct CU II and today we're turning our attention to another prime suspect, the Palit Super JetStream. Priced at £175, the Super JetStream is Palit's top-of-the-range GTX 960 and it commands a small £15 premium over the company's bog-standard OC model. That takes us further from the £150 sweet spot we think GTX 960 needs to target, but for the additional outlay Palit does throw in some useful extras. The most obvious of which is the dual-fan cooler. Styled almost identically to its GTX 980 counterpart, the 960 Super JetStream carries over the red-on-black aesthetic and has a heatsink that's considerably larger than the underlying PCB. It's so large, in fact, that the cooler protrudes beyond the standard dual-slot form factor. Measuring 247mm in length and tipping the scales at 626g, the GTX 960 Super JetStream is 33mm shorter than Palit's top-of-the-line GTX 980, thought it could easily have been smaller. See the single six-pin power connector in the image above? That's where the PCB ends, and the overhanging cooler can be deemed overkill in the extreme. Palit's shroud isn't quite as thick or solid-feeling as Asus's DirectCU II, but build quality is reasonable throughout and there are three well-sized copper heatpipes drawing heat away from the GM206 GPU. The one surprise omission for a Super JetStream card is that there isn't a rear backplate covering the PCB and aiding cooling. As you'd expect from a modern-day design based on the Maxwell GPU, both of Palit's 90mm fans turn off when the card is idle and only kick into action when GPU temperature reaches 55ºC. We're expecting the Super JetStream to run extremely quiet at all times, and we'll confirm noise levels a little later in the review. Aside from meaty cooling, the Super JetStream's other claim to fame is one of the largest factory overclocks available on a GTX 960. Right out of the box, the card's base clock is ramped-up from 1,126MHz to 1,279MHz, while boost frequency jumps from 1,178MHz to a massive 1,342MHz. That's a 14 per cent increase right off the bat, and Palit also overclocks the controversial 2GB frame buffer from the reference 7,012MHz to an effective 7,200MHz. For reasons we can't explain, Palit doesn't appear to be keen on Nvidia's default array of display outputs. 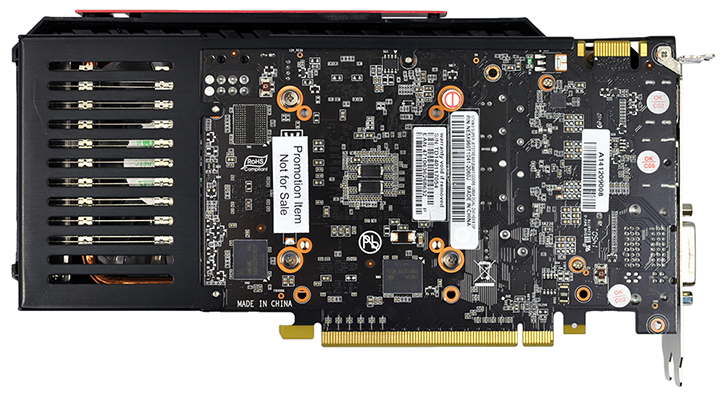 The company's GTX 980 JetStream opted instead for a number of mini outputs, and the GTX 960 JetStream takes a another different approach with two DVI outputs alongside a single DisplayPort 1.2 and a single HDMI 2.0. All four can be used concurrently, however we'd have preferred the reference configuration of HDMI, DVI and three DisplayPorts. The addition of a backplate and revised outputs would enhance Palit's overall package, but even so, we have one of the highest-clocked GTX 960s priced competitively at £175. Let's see how that 1,342MHz boost clock holds up in our benchmarks.